South India level science fair 2018, State Level Science, Maths & Environmental Science Exhibition, NCERT SME Exhibitions, Jawaharlal Nehru Science,Mathematics, Environment Exhibition For Children 2018(SLSMEE): National level Science,Mathematics, Environment Exhibition for Children 2018-JNNSMEE guidelines. 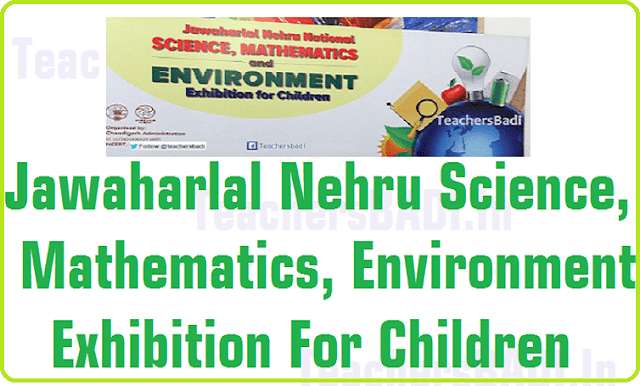 Jawaharlal Nehru Science,Mathematics, Environment Exhibition For Children 2018. District Level Science, Mathematics, Environment Exhibitions for Children 2018. SCERT Telangana, Rc. No. 551/Sci/SCERT-TS/2016 Dated: 09-08-2018: Sub: SCERT, TS Hyderabad - Sending of entries for participation of Jawarharlal Nehru Science, Mathematics, and Environmental Education (JNSMME) for the children 2018 organized by NCERT in the month of November / December, 2018 - Reg. తెలంగాణ నుంచి 6 ప్రాజెక్టులు ఎంపిక: పిల్లల్లో సైన్స్‌పై ఆసక్తి పెంచేందుకు, వారిలోని ప్రతిభను వెలికితీసేందుకు ప్రతిష్ఠాత్మకంగా భావించే 45వ జవహర్‌లాల్‌ నెహ్రూ జాతీయ సైన్స్, గణితం, పర్యావరణ ప్రదర్శన-2018ను నవంబరు 23 నుంచి 28 వరకు ఆరు రోజులపాటు నిర్వహించనున్నారు. జాతీయ విద్యాపరిశోధన, శిక్షణ మండలి(ఎన్‌సీఈఆర్‌టీ) ఆధ్వర్యంలో గుజరాత్‌లోని అహ్మదాబాద్‌లో జరిగే ఈ ఎగ్జిబిషన్‌కు దేశవ్యాప్తంగా 170 ప్రదర్శనలు(ఎగ్జిబిట్లు) ఎంపికయ్యాయి. అందులో తెలంగాణ నుంచి ఆరు ఉన్నాయి. Who are interested to participate in state level "Science Fair" at Siddipet District. Send project details, wich is the best project in yur district. 5, Name Of the Mandal ,School name,Students name and Guide Teacher Name. F.No. 6.30/DESM/2018-19/ ; Date: 06/06/2018 : Theme, sub-themes and topic for one day seminar for State Level Science Mathematics and Environment Exhibition (SLSMEE), for children 2018-19 and Jawaharlal Nehru National Science Mathematics and Environment Exhibition (JNNSMEE), for children 2019, have been finalized and are as follows. "Scientific Solutions for Challenges in Life"
"Water management: Possibilities and ways ahead"
The attention of all the Headmasters of secondary schools of all the managements in the district is invited to the reference read above, and they are informed that the State Level Science, Mathematics and Environmental Exhibition is to be conducted from 20.12.2017 to 23.12.2017 at Telangana Social Welfare Residential school for Boys Madikonda, Kazipet mandal, Warangal (Urban). In this connection, the schedule to the school children to Mahabubabad district is fixed on 23.12.2017 from 09.30 AM to 2.00 PM to visit the State Level Science Exhibition 2017. Hence, all the Headmasters of Secondary school in all managements in the district are to make arrangements to bring their children along with on 23,12.2017 from 09.30 AM to 02.00 PM. PROCEEDINGS OF THE DIRECTOR, STATE COUNCIL OF EDUCATIONAL RESEARCH AND TRAINING, TELANGANA, HYDERABAD. Sub:- O/o. SCERT, TS, Hyderabad - Conduct of State level Science, Mathematics and Environment Exhibition (SLSMEE) - Telangana Social Welfare Residential school for Boys, Madikonda, Warangal (U) district - revised dates of exhibition from 21st - 23rd December, 2017 and 20th December, 2017 is registration day - Reg. Ref:- 1) Proc. Rc.No. 551/Sci/SCERT-TS/2016, Dt. 22-11-2017 of this office. All the District Educational Officers in the state are hereby informed that the State Level Science Exhibition is rescheduled to 21st -23rd December, 2017 (registration day as 20th December, 2017) instead of 28-30 December, 2017, where 27th December, was registration day, as was informed in ref- 2 above. Therefore, all the DEOs are requested to note the change in the dates of conduct of State level science Exhibition and instruct the DSO concerned, District level winners and guide teachers on the re-schedule dates of District level Science Exhibition. To All the District Educational Officers in the state. All the RJDSEs in the state. Copy to the DIETS, CTEs, IASEs and Teacher Education Colleges for information. Copy to the C&DSE, TS, Hyderabad for kind information. SLSMEE: State Level Science, Maths and Environment exhibition from December 21 in Warangal: State-level science, Mathematics and Environment Exhibition 2017-18, with a theme ‘innovations for sustainable development’, will be held here from December 21 to 23. The three-day event will be organised at Telangana State Social Welfare Residential School (Boys) at Madikonda on the outskirts of Warangal city. State Council of Education Research and Training (SCERT) Director said a total of 494 exhibits from 31 districts would be put on display and National Institute of Technology (NIT), Warangal, and Kakatiya University (KU) would put up stalls at the expo. Deputy Chief Minister and District Collector were personally overseeing the arrangements. Several committees for food, accommodation, transportation of students were constituted for the smooth conduct of the programme. December 22 would be celebrated as Mathematics Day, the birth anniversary of Sri Srinivasa Ramanujan at the District Science Centre in Warangal. "Another prestigious event, South India level science fair, has been allotted to Telangana this time and it will begin from January 8 at Hyderabad. It will be attended by school students of Andhra Pradesh, Tamil Nadu, Telangana, Kerala, Karnataka, Pondicherry and Andaman and the Nicobar Islands,". The science exhibition would encourage the participants to hone their creative skills and develop their scientific temper. The overall objective was to widen the resource base of the country’s scientific pool in future. SCERRT Telangana - Rc.No. 551, Dt.13-12-2017 :: Sub: O/o SCERT, TS, Hyderabad - Conduct of State level Science, Mathematics and Environment Exhibition (SLSMEE) - Telangana Social Welfare Residential school for Boys, Madikonda, Warangal (U) district Postponement of schedule and rescheduled to 21st - 23rd December, 2017 and 20th December, 2017 is registration day - Reg. :: Ref:- Proc. Rc.No. 551/Sci/SCERT-TS/2016, Dt. 22-11-2017 of this office. The attention of all the District Educational Officers in the state is invited to the subject cited above are hereby informed that the State Level Science Exhibition is rescheduled to 21st-23rd December, 2017 (registration day as 20th December, 2017) to be held at Telangana Social Welfare Residential School for Boys, Madikonda, Warangal (U) instead of 20-22 December, 2017, where 19th December, was registration day. Therefore, all the DEOs are requested to take the note of change of rescheduled dates on conduct of State level science Exhibition and instruct the DSO concerned, District level winners and guide teachers of the District level Science Exhibition. D.O.Lr.No. 551, Dt. 25-11-2017 :: Sub: Jawaharlal Nehru National Science Mathematics & Environment Exhibition for Children (JNNSMEE) - conduct of State level science exhibition - at Telangana Social Welfare Residential school for Boys, Madikonda, Warangal (U) - from 19th - 22nd 21st-23rd December 2017 - Information - Reg. (ii)· Proc. Re.No. 551/Sic/SCERT-TS/2016, Dt. 9-9-2017 of the Director, SCERT, TS, Hyderabad. (iii) Proc. Re.No. 551/Sic/SCERT-TS/2016, Dt. 11-10-2017 of the Director, SCERT, TS, Hyderabad. (iv) Proc. Re.No. 551/Sic/SCERT-TS/2016, Dt. 14-11-2017 of the Director, SCERT, TS, Hyderabad. I wish to inform you that, Government of Telangana has decided to conduct State level Science Mathematics and Environment Exhibition at Telangana Social Welfare Residential school for Boys, Madikonda, Warangal (U) district from 19th - 22nd 21st-23rd December 2017 (20th December is registration day). The district level winners will display their projects/models in the state level exhibition. About 486 students & 486 guide teachers i.e., total 972 will take part in the state level science exhibition. Accommodation for boys and male guide teachers is proposed in the hostel of Telangana Social Welfare Residential school for Boys and accommodation for girls and female guide teachers may be given in the hostel of Telangana Social Welfare Residential school for Girls, Madikonda, Warangal (U) district. Therefore, I request you kindly issue instructions to the concerned principals of Telangana Social Welfare Residential school for Boys, Madikonda, Warangal (U) district, Telangana Social Welfare Residential school for Girls, Madikonda, Warangal (U) district to extend their cooperation for smooth conduct of state level science exhibition. SCERT Telangana - Rc.No.551, Dated:22-11-2017 :: Sub: SCERT, Telangana, Hyderabad - JNNSMEE - conduct of SLSMEE - venue & dates for SLSMEE in the state - coinmunicated - Reg. (ii) Proc. Re.No. 551/Sic/SCERT-TS/2016, Dt. 9-9-2017 of this office. (iii) Proc. Re.No. 551/Sic/SCERT-TS/2016, Dt. 11-10-2017 of this office. (iv) Proc. Re.No. 551/Sic/SCERT-TS/2016, Dt. 14-11-2017 of this office. Venue: Telangana Social Welfare Residential School for Boys, Madikonda, Warangal (U) District. The District Educational Officers are requested to inform the above details to all the district level selected students and teachers to participate in the State level Science Mathematics and Environmental Exhibition duly following the instructions as detailed. 1. The list of student and teachers selected at the respective districts shall be counter signed by the District Chairperson I District Educational Officer. 2. The selected candidates must obtain the bonafide certificate from concerned headmasters with specifications of class, school, parents name, guide teacher name, brief write up (not exceeding 1000 words). 4. Proper instructions and guidelines are to be given to the students and guide teacher and they are requested to improve the exhibit before presenting them at State Level Exhibition. 5. A Senior Headmaster/MEO/DSO should accompany with the participants. 6. All the candidates who participate in the state level exhibition shall be informed to register their names and exhibits (sub theme wise) one day before the actual commencement of the exhibition i.e., on 19-12-2017 after 2.00 P.M onwards. 7. Senior official who is representing the district shall bring the selected exhibits write-ups, proforma already communicated to them in MS-Word in Pendrive should be handed over to the registration committee at the time of registration i.e., on 19-12-2017. 8. And also five minutes video presentation in CD by the student about the exhibit. 9. All the winners list should be mailed to tgscert@gmail.com on or before 30-11-2017. 10. For any further details about SLSMEE please contact No. 9949038628, Ch. Keshava Rao, DSO, Warangal (U). SCERT Telangana - Rc.No.551, Dated: -10-2017 :: Sub: O/o SCERT, TS, Hyderabad - Conduct of Science Exhibition at District level and at State level (SLSMEE) in Telangana State for participation in Jawaharlal Nehru National Science, Mathematics & Environmental Exhibition for Children (JNNSMEE) 2017-18 organized by NCERT and SISF 2018 - forwarding guidelines - Reg. (iii) D.O.No. 24(18)/EDEXT/SISF 2018/51291, Dt. 5-7-2016 of Director, Visvesvaraya Industrial & Technological Museum, Bangalore. v) mail received from Assistant Professor (Physics), Department of Education in Science and Mathematics, NIE, NCERT, New Delhi. vi) Proc. R.c.No. 1252/RMSA/TS/2017, Dt. 11-10-2017 of C&DSE & Ex. Officio Project Director, RMSA and Model school, TS, Hyderabad. All the District Educational Officers in the state are invited to the subject cited, as per the guidelines of NCERT, New Delhi all the states should organize science exhibitions under the caption of Nehru National Science, Mathematics & Environmental Exhibition for Children (JNNSMEE) 2017-18. As a pre requisite for sending winners to JNNSMEE 2018 and SISF 2018 there is a need to conduct district level and state level exhibitions. The theme for SLSMEE 2017-18 and JNNSMEE 2018 is "Innovations for Sustainable Development". The sub themes listed above are only suggestive. Students are free to choose any other sub themes and develop exhibits involving innovations in science, Technology and Mathematics for Sustainable development. In this context Department of Mathematics and Science, SCERT, TS has framed certain guidelines for conduct of District level and State level Science Exhibitions. SCERT Telangana ::Rc. No. 551, Dated: 09-08-2017 :: Sub: O/o. SCERT, TS, Hyderabad - Sending of entries for participation of Jawaharlal Nehru Science, Mathematics and Environmental Education (JNNSMEE) for the Children 2016-17 organized by in the month of November/December 2016 - Reg. Ref:- F.No. 12-1/DESM/2017-18/JNNSMEE, Dt. 01-08-2017 of Prof. R.K. Parashar, Coordinator, JNNSMEE 2017, Department of Education in Science and Mathematics, New Delhi. All the District Educational Officers and Principals of DIETs in the state are invited to the subject cited, authorities of NCERT have agreed to accept the entries by 15th August 2017 on the themes identified for conduct of SLSMEE and DLSMEE of 2016-17 on the basis of the recommendation of the SCERT duly evaluating by the expert committee based on the criteria given by the NCERT. Southern India level/South India level science fair : 7th - 12th January 2018 (January Registration) at St. Patricks High School, Sec-bad. National level : in the month of November 2018. Sub: O/o. SCERT, TS, Hyderabad - Conduct of Science Exhibition at District level and at State level (SLSMEE) in Telangana State for participation in Jawaharlal Nehru National Science, Mathematics & Environmental Exhibition for Children (JNNSMEE) 2017-18 organized by NCERT and SISF 2018- Reg. v) E-mail received from Assistant Professor (Physics), Department of Education in Science and Mathematics, NIE, NCERT, New Delhi, dt: 22.08.2017. All the District Educational Officers in the State is invited to the subject cited, as per the guidelines of NCERT, New Delhi, the Dept. of School Education, Telangana State will conduct District Level Science, Mathematics & Environmental Exhibition (DLSMEE) in all the Districts and State Level Science, Mathematics & Environmental Exhibition (SLSMEE) for the year 2017-18. Vide reference 2nd cited, the Govt. of Telangana is hosting Southern India Science Fair (SISF) 2018 at St. Patricks High School from 3rd-7th January 2018 (2nd January 2018 Registration). In this regard, all the DEOs are requested to conduct the District Level Science Exhibitions by 15th November, 2017 in their respective Districts. The winners of the District Level in above said theme/ sub themes will participate at State Level. The SLSMEE will be held in the month of December, 2017. The dates, venue of SLSMEE and the State guidelines and norms for the conduct of DLSMEE will be informed later. Further, it is informed that the winners at the SLSMEE will participate in SISF-2018 and JNNSMEE 2017-18. Therefore, the DEOs are requested to identify the venue with sufficient infrastructure and facilities to hold the DLSMEE. Further they are requested to communicate to all the Upper Primary and Secondary schools well in advance on the conduct of DLSMEE in the District and to give media coverage on conduct of the event.